Kone Elevators has been awarded a 2009 Good Design award for its sleek Kone Design signalization series. Founded in 1950, Good Design is renowned as one of the most recognized design awards program in the world. The awards are given by The Chicago Athenaeum and The European Centre for Architecture Art Design and Urban Studies to highlight the best new designs and design innovations for products and graphics which were made between 2007 and 2009. Launched in 2009, the Kone Design signalization series offers contemporary design and durable technology, which is built to last for decades. By simply changing the color or design of the faceplate, the panel can be modified easily. The signalization panel also enables the integration of guiding information on the panel, which brings usability to a new level. Anne Stenros, Vice President, Design, Kone Elevators was delighted with award. 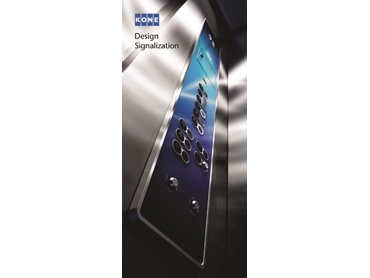 “The new Kone Design signalization series represents a new perspective in modern elevator design. It is a bold jump from standard stainless steel signalizations to a new world of colors and unique graphics, which can match any kind of cabin design,” she said. In 2008, Kone Elevators received its first ever Good Design award for its innovative Kone FourSeasons concept, which made Kone the first lifts and escalator company to ever receive such a prestigious award.